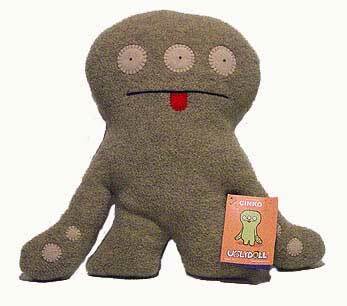 Description Of Item: Cinko is an Uglydoll of the deep. Keep him away from water though... he can't swim! Cinko is very shy and quiet, but has a funny sense of humor. He likes to waddles around and stick his tongue at everything and everyone. Because this is not polite for people to do, Cinko makes the perfect pal! Instead of sticking your tongue at folks, just hold up Cinko and let his funny little face do the talking for you.